Everybody has opinions. But what happens when your opinion has the power to affect returns of lakhs of investors? The answer is, a lot of confusion. Research reports by well-known firms can move stock prices. And if the report is too harsh on the company, the result is a bitter controversy, with both sides pointing fingers at each other. What should investors do in such cases? To find out, Money Today takes you into the chambers of fund managers and investment officers. Several research firms have of late released negative reports about listed companies. The latest is Canada-based Veritas, which has pointed fingers at the Indiabulls management. 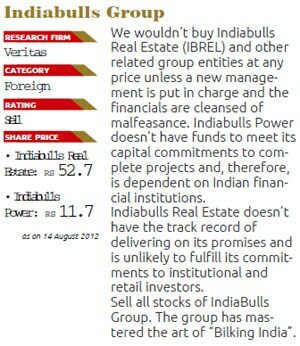 Its report, released on August 1, said, "We believe that disclosures at Indiabulls Real Estate Limited (IBREL) and Indiabulls Power Limited (IBPOW) are unreliable and that the sole purpose of IBREL is to bilk institutional and retail investors for the benefit of select insiders." "The controlling shareholders are running the organisation as a piggybank, while proclaiming propriety and espousing credibility," it said. In response, Indiabulls said it will initiate criminal proceedings against the authors of the report for allegedly publishing false and factually incorrect data to create sensation for the sole purpose of selling their report. The report, which hit the Indian market on August 8, pulled down the stocks of group companies Indiabulls Financial Services, Indiabulls Power and Indiabulls Securities by 10-17%. The stocks, however, ended the day with only a 0.8-3.7% loss. 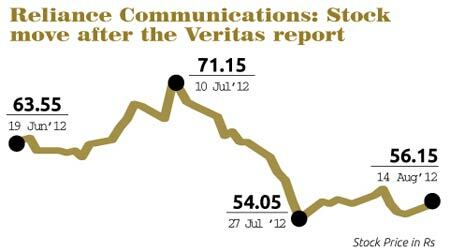 Reliance Communications also had a run-in with Veritas which called the company's accounting policies as 'whimsical'. The Veritas report said: "We believe that the company's accounting policies are whimsical and do not provide a clear picture of the underlying operating and business trends." The report said the company was entering a phase of maximum uncertainty. It raised concerns over the company's proceeds from Flag IPO, sale of tower assets, high debt, and accounting and governance practices. On June 19, RCom issued a statement which read like this: "The Veritas report lacks any credibility and is mala fide in intent and approach." The statement further read that "the report is full of factual inaccuracies and baseless allegations masquerading as research." Veritas' report had recommended "sell" on the stock and valued it at Rs 15. Interestingly, while the report was dated June 8, the stock reacted on June 19 and plunged 9% intra-day to a new 52-week low of 59 on the National Stock Exchange. It ended the day 2.5% down. The RCom stock ended August 7 at Rs 57, after touching a 52-week low of Rs 53.40 on July 27. 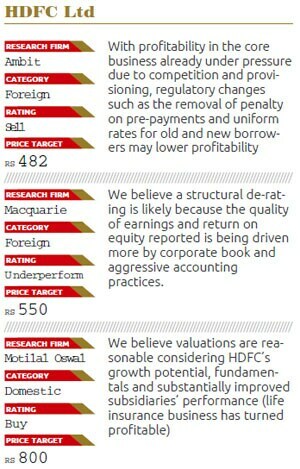 Before this, on June 14, a report by Macquarie Equities Research downgraded the HDFC Ltd stock from 'outperform' to 'underperform' and reduced the price target by 30% to Rs 550. The research firm said the company had adopted aggressive accounting practices to inflate earnings and return on equity. "Over the past two years, HDFC Ltd has been adopting aggressive accounting practices by passing provisioning through reserves and also making adjustments for zero-coupon bonds through reserves," it said. The stock fell nearly 2% that day to Rs 644. In response to the report, HDFC Ltd issued a statement saying that "The management completely disagrees with the contents of the Macquarie report dated June 14 as the analyst concerned has not attempted to meet anyone from HDFC and verify the facts and statements made therein." While most such reports have been from foreign entities, some Indian brokerages have been in the fray too. 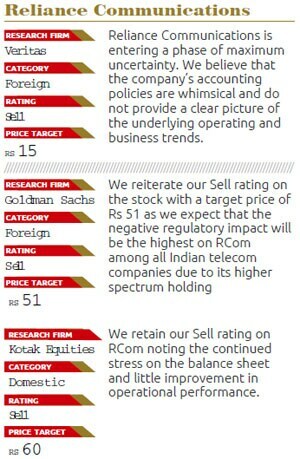 For example, Kotak Institutional Equities, which has a 'sell' rating on RCom with a target price of Rs 60, said in a May 28 report that it was perplexed by some accounting items or policies. Research reports affect stock prices, more so if they are hard-hitting. So, why isn't any action taken against those writing them if they are misleading? Sandeep Parekh, founder of Finsec Law Advisors and former executive director at the Securities and Exchange Board of India, says, "Since many of these views are opinions, there is rarely a cause for action unless someone can prove specific misconduct." 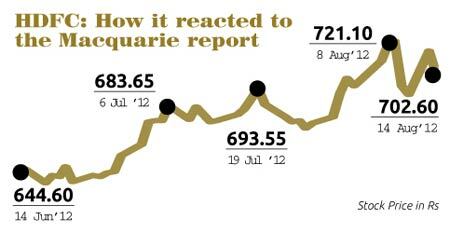 The investing fraternity has diverse views about such reports. While a few say they have limited use in decision-making, for some, the dependence is pretty high. "A research report is a good secondary source of information. However, the final view is taken by the firm's investment team," says Hemant Kanawala, head of equities, Kotak Mahindra Old Mutual Life Insurance. Gopal Agrawal, chief investment officer, Mirae Asset says, "We don't take buy or sell decisions on their comments." Some fund managers say they do take a second look if the report has strong views. "We like to read negative reports because analysts are generally hesitant to write such reports unless they really believe in their views," says a fund manager at a foreign fund, on the condition of anonymity. "Research reports have an important role in ensuring a non-biased third-party review. However, given the strong relationship companies have with brokerages/research houses, a lot of reports rarely question malpractices," says Nilesh Shetty, associate fund manager at Quantum Asset Management. Do fund managers differentiate between foreign and domestic brokers? "Not really. The track record of the analyst and the research firm is important," says Kanawala of Kotak Life. "One job of fund managers and analysts is to know which brokers/analysts are good," says the fund manager of a foreign fund. According to fund managers, the track record of the analyst is of utmost importance, irrespective of the firm he or she works for. "We never distinguish between local and foreign brokers, it's the quality which matters," says Agrawal of Mirae.